As students from the Miccosukee Indian School look on, technician Rafael Diaz prepares to test a water sample. 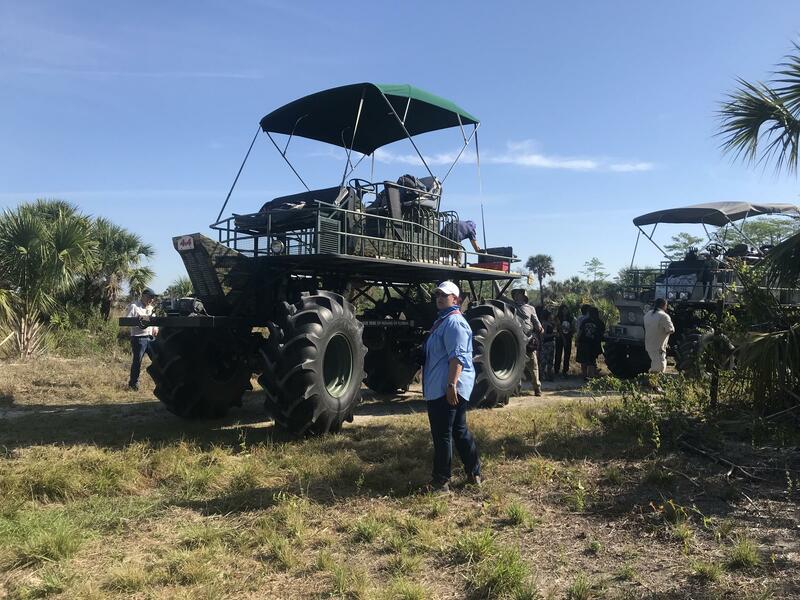 A caravan of swamp buggies made its way through Sherrod Ranch, north of I-75/Alligator Alley, during the Miccosukee tribe's spring water study. Near the end of the trip, a Miccosukee elder led students and other water study participants to see a massive cypress tree. Students and volunteer Dorian Jumper, right, take videos and photos of the baby alligators. For the Miccosukee tribe, the Everglades has been home for about 200 years: ever since ancestors of today's tribe members were forced south from Alabama and Georgia. Soldiers and settlers pushed tribe members into the swamp, where they built villages and grew crops on tree islands, and hunted and fished in canoes. The Everglades kept the Miccosukees safe. Now, every fall and every spring, the tribe dedicates an entire week to checking on the Everglades' health. They call it the "water study," and it's as much about the tribe's spiritual connection to the land as it is about water quality testing. The water study is sort of like a big family picnic with science. Staff from the tribe's water resources department are joined by tribe elders, families and other people who work for or with the tribe on Everglades restoration. They make their way to different properties the tribe owns throughout South Florida, in a series of day trips that often stretch from dawn to dusk. 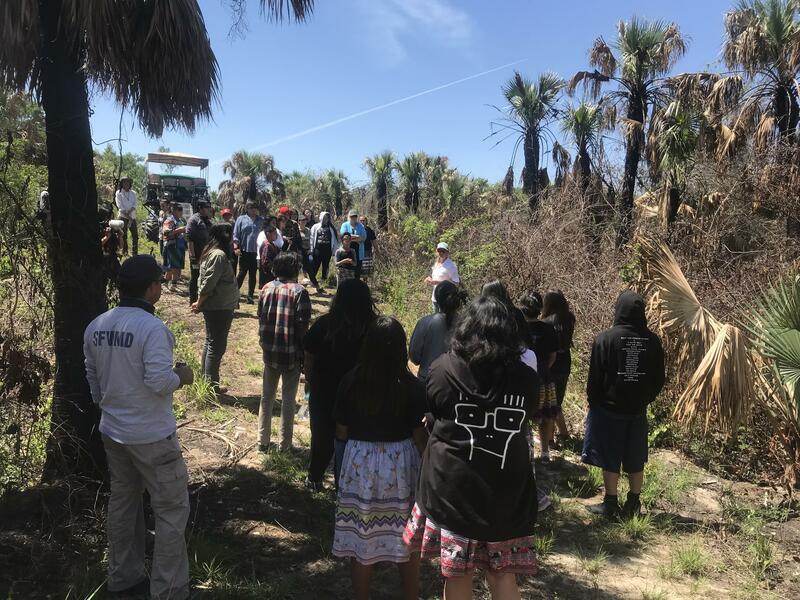 Every year, students from the Miccosukee Indian School join for a day of fieldwork. A caravan of swamp buggies makes its way through Sherrod Ranch, north of I-75/Alligator Alley, during the Miccosukee tribe's spring water study. "The way you teach your children is not in the classroom," said tribe elder Michael Frank. "Our culture is right here in the Everglades, in the Big Cypress park, in the open environment. That’s how we teach our children." 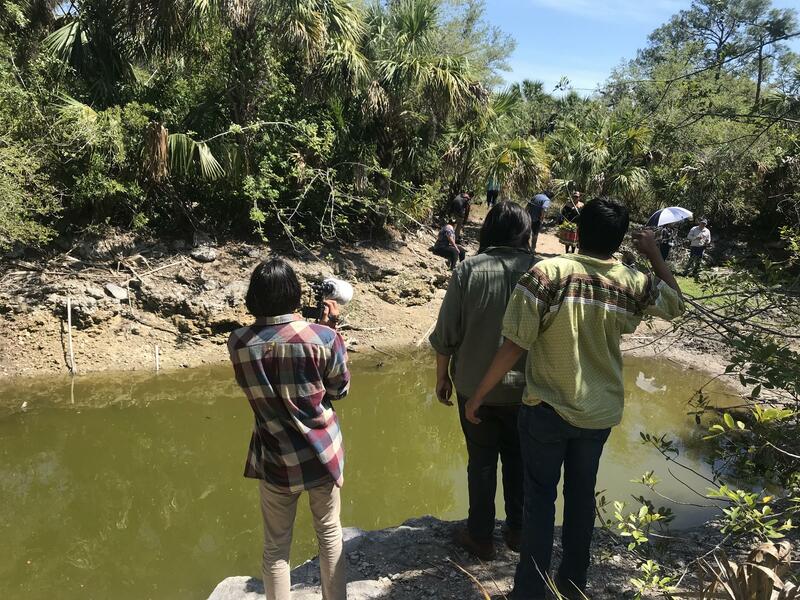 This year, the students participated in water testing at Sherrod Ranch, a 2,400-acre property about 12 miles north of the Miccosukee Service Plaza on I-75. It took nearly three hours for them to make the trip up from their school on Tamiami Trail: Smoke from wildfires in the southern part of the Everglades ecosystem delayed their bus. But once they arrived, they found seats in a caravan of about 25 swamp buggies and all-terrain vehicles, which drove down a bumpy trail to begin sampling -- and exploring. 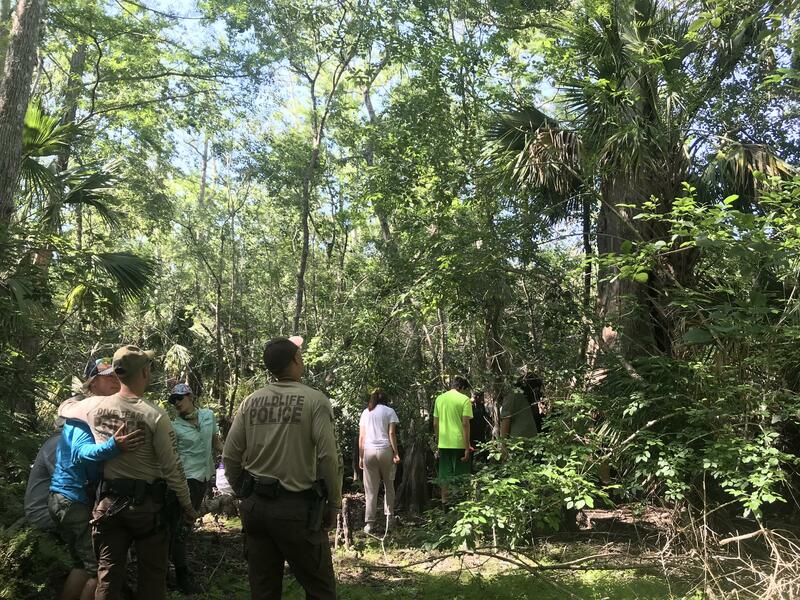 Students and an expert from the South Florida Water Management District listen as Amy Castaneda from the Miccosukee Water Resources Department talks about the role of fire in the Everglades ecosystem and its impact on Sherrod Ranch. At the first stop, water resources staff members led the students through a thicket of shrubs and palmettos, carefully avoiding thorny smylax and poison ivy. 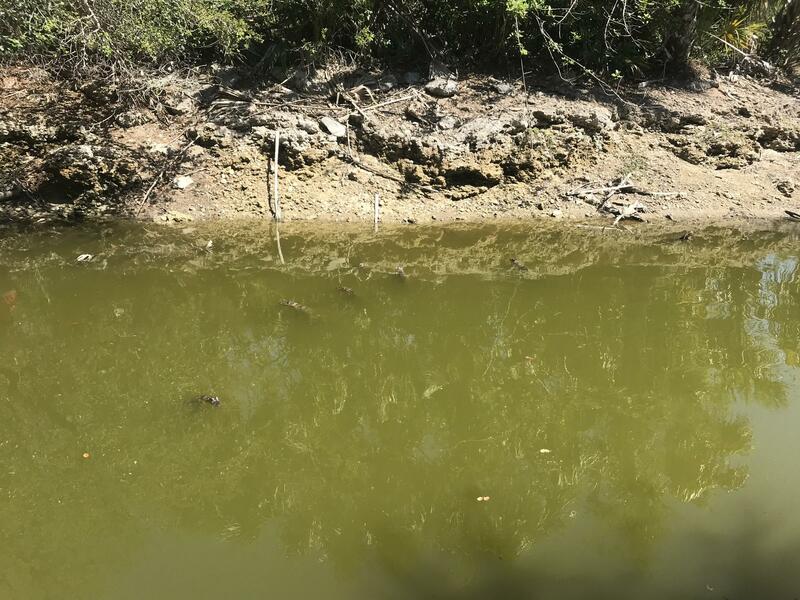 With a jar attached to a long pole, one student scooped a sample of water from a pond and brought it back to technician Rafael Diaz. Diaz tested the sample for dissolved oxygen -- "how much life it’s holding, how much life it can support." Diaz also showed the students how to measure water salinity (how salty it is) and turbidity (how cloudy). After the sample is preserved, it's sent to a lab to test for nutrients like phosphorus and nitrogen. The goal of the water study is to check whether there’s been progress in restoration -- reducing harmful runoff from cattle ranches, sugarcane fields and orange groves farther north, and ensuring an even flow of water south through the Miccosukees’ land, through Everglades National Park and into Florida Bay. Under a large hut called a chickee, the water study participants ate lunch: sandwiches, salads, a cornmeal drink called sofkee, and icy sodas from coolers bungeed to the swamp buggies. Afterward, a tribe elder started speaking the Miccosukee language. It’s a sign for non-tribe members to leave while the elders talk with the students about their culture. As he lounged out of earshot in the shade of a nearby tree, Dorian Jumper didn't seem to mind being left out. He's Seminole, but used to go on these trips as a student at the Miccosukee Indian School. He's returned to help with the water study as a volunteer. "I do find it extremely important that people know what it is and what it’s about," Jumper said. "When you care about the environment at home, you know, you also care about other environments elsewhere -- deserts and forests." After the elders finished their talk, the testing continued: At one stop, some of the students even found seven baby alligators. But the water in that pool and some others was green and cloudy -- barely worth testing, said the tribe’s water resources director. The nutrient levels are way too high for the Everglades ecosystem. A pool of water on Sherrod Ranch. Barely visible: baby alligators. The visible challenges to the Everglades worry some of the students and teachers. "I've been going [on the water study trip] since I was in middle school, and you kind of see the difference between then and now," said William “Popeye” Osceola, a language arts teacher at the Miccosukee school. "Even how dry it is out here. It’s, like, extra dry out here compared to the previous years." Tenth grader Kendrick Osceola said what she’s seeing on the water study trip reminds her of what she’s seeing in other places. "I’m just worried about the water drying out or us getting flooded out," she said. "As soon as it rains, the reservation gets flooded, like, for days." It’s not just water problems that worry her. "I never knew the melaleuca was an invasive species until I was learning about it in class," Kendrick Osceola said. "Then we came out here and we were looking at all the plants and we were seeing the damage it was doing to everything else. ... They try to control it, but it’s like, uncontrollable." Most of us in South Florida benefit from the Everglades: Freshwater flowing through the ecosystem recharges the freshwater Biscayne Aquifer that provides drinking water to about eight million people in Monroe, Miami-Dade and Broward counties. The freshwater flow over the land also pushes back against saltwater intrusion from sea-level rise. And, the massive expanse of swamp provides a buffer against hurricanes, absorbing water from the storms. Several of the students said they hope to use what they've learned on the water study to help other people better understand South Florida’s dependence on the Everglades. "People in the cities... don’t really care about what goes on out here. And nobody even knows we do these water studies," said Kendrick Osceola. "But there’s a lot of information that we could bring out to the city and share with people." The Tamil word for python is "malaippāmpu." Translated literally, it means "mountain snake." But two Tamil-speaking snake trackers from India, who are in South Florida to help with the region's python problem, think "water snake" would be a more appropriate name. We revisited an interview we had with Miccosukee Indian School teacher William Osceola. The k-12 school has about 150 students and the most recent graduating class had seven students. Osceola told us how the accredited school is modeled to highlight Miccosukee tradition but also provides an education that parallels traditional public school outside of the reservation.